Bad Dan Shultz Gang Hit Taneycomo! Looks like nice weather ahead. Temperatures in the 80s through the weekend. Chance of showers Monday and again on Wednesday. Weather today was beautiful! Low 80s and sunny. Just enough wind to give us a little chop on the water. The generation pattern is also great. No generation today except for a low one unit at 6:000 p.m. for one hour. Same thing for tomorrow. Monday looks like no generation until noon, when one unit will come on, then another in an hour, with about two units going four 3-4 hours. I kind of expect pretty much the same pattern next week as we have seen the past two weeks. No units in the a.m. then something in the afternoon. Monday, the Bad Dan Shultz Gang hit Taneycomo. When we last looked, other than lots of sore lip trout, not too much damage was done. This neat group consisted of fathers and sons, brothers, and just life-long friends who have been fishing together for many years. If I remember correctly, the age range was from 87 to 59. It was a slow start for everyone in the morning. However, by the afternoon and drifting downstream a ways, it quickly turned into a great catching day for everyone. Dana had Joe and Arn. They did well on the little ruby, the P&P and copperhead black zebra midges. Stan’s guys, “Dutch” and “Bad Dad” had a great day on the P&P and little ruby midges. Tom and Steve, who were with Darrell, were also catching on the little ruby and the P&P midges. On Tuesday, Jim took Jim and Elizabeth out for half a day. Jim is a fairly new fly fisher so Jim worked with him on techniques. They worked and caught fish on the size 12 olive wooly bugger and the P&P midge with a blood worm dropper. Elizabeth enjoyed the morning. Carolyn had Jan and Mike out for the day. This was the first day of their two day fishing. They have both been in Hungary for two years and this was one of the first things to do when they got back to the States. This was a good day for both of them. Jan did especially well on the ruby midge. Mike caught several on the size 12 olive wooly bugger. Once they turned on the water, it was the big ruby with a red San Juan dropper. Jan didn’t miss a drift almost without a hit or fish. 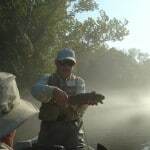 This entry was posted on Saturday, September 14th, 2013 at 5:21 pm	and is filed under Fishing Reports. You can follow any responses to this entry through the RSS 2.0 feed. You can leave a response, or trackback from your own site.